Archaeological records indicate that a settlement at Aberlady dates from at least the 7th century AD but it was probably located to the north of the present church ( i.e. at Kilspindie Castle - remains of the castle can still be seen, see picture, right. ), where some archaeological finds have been made. Medievil remains have also been found on the Luffness ( east ) side of Aberlady. The present layout of the village is medieval in origin and may date to the 12th century. It was then, in 1149, when King David 1 was on the Scottish throne, that Aberlady was - in a Royal Charter - confirmed as a port. But it took almost 500 years more ( 1633 ) before it was officially recognised as 'The Port of Haddington'. The same year - 30 years after the union of the crowns - Charles 1 King of England was also crowned King of Scotland. Name The origin of the name, Aberlady is unclear. Throughout its history there has been many different spellings used. It has been known as Aberlessic ( 12th century ), Abirleuedi, Aberlefti (13th century ) and in the 15th century Abirladye, Aberladye, Abirlathie to mention a few. 'aber' means 'mouth of', and it is thought that the Peffer Burn was once known as the 'Leddie', which leads some people to believe that it is from these two words that the name is derived. Silted Up Under its new status Aberlady prospered. Over the years Aberlady Bay has silted up, but at that time ships of around 60 or 70 tons were able to anchor quite close to shore, with their cargoes of timber, manure, bark for the tanners, etc.. The customs house ( circa. 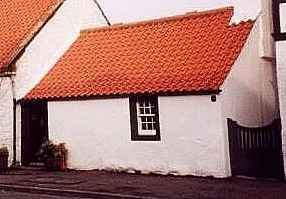 17th century ), situated close to the present day Kilspindie Golf Club, was known as 'The Town of Haddington's House' and was where all shipping transactions took place. There were some however who preferred to carry on their business in an unofficial manner. We are referring to the smugglers who were known to ply their trade in the area. Decline By the early 18th century Aberlady was thriving and it had become a major centre for weaving. This prosperity did not last for much longer though - only until the mid 19th century - when Aberlady was in serious decline. So much so that the rights of anchorage, etc., were sold to the Earl of Wemyss for the sum of £375. The port of Leith became the preferred destination for cargo, and the arrival of the railways meant that goods no longer needed to be transported through Aberlady. As it declined as a port the weavers and others gradually drifted away. But the railway did offer some compensation in that, when the Gullane and Aberlady railway was opened on 1st April 1898, it made access to the village much easier, and consequently it attracted a lot of visitors, much as it does today. War Years Aberlady would once again come to the fore during World War 2 when Gosford House - to the West of Aberlady - was taken over in 1940 as a camp to house british troops including the Kings Own Scottish Borderers. Later in the war it was used as a POW camp for German prisoners. Considering that it was war time they were treated very well. Today East Lothian's coastline, including its beaches, is considered a great asset, but in the war it was thought that many stretches of it would provide ideal landing areas for german forces. So steps were taken to avert, or at least lessen this danger. 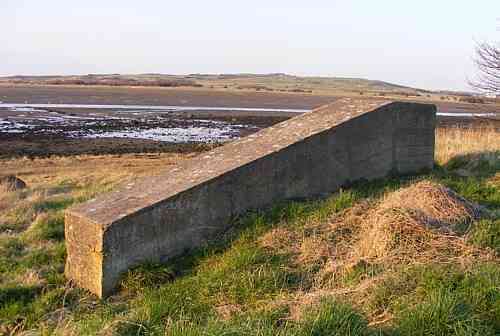 In Aberlady Bay this involved the laying of large concrete blocks accross it - North to South - and at right angles to it, along the shoreline. 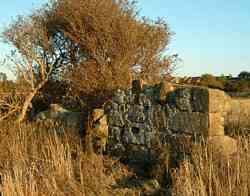 One of these can still be seen at the Eastern boundary of the village. Others can be seen between Aberlady and the village of Longniddry to the West. After the war Aberlady returned to being just another sleepy East Lothian village. And it has retained this charm to the present day.